I'm looking for a cartoon. As I can remember, the story follows a group of teenagers under the guidance of a virtual, priest or monk-like man in white clothes (who always appears on a big monitor), as they fight in a digitalized version of their city. The main antagonist is a human-like bug, and his minion is a teenager guy who can program the virtual city, where the main characters are fighting. Not sure: most of the base situation involves the main antagonist turning the main characters' city into a virtual world. High school student Sam Collins is the head of a band called Team Samurai. During a recording session, Sam is zapped by a power surge and disappears, only to reappear seconds later with a strange device attached to his wrist which, at the time, is unremovable. Later after his friends Amp, Sydney, and Tanker leave, one of his video game programs, dubbed Servo, is subject to a power surge and zaps Sam again just after he has remarked "Cool battle armor!" This time, the zap pulls him into the digital world and turns him into his creation. As Servo, he roams the digital world and fights monsters called Mega-Viruses. Meanwhile, another student from Sam's school, named Malcolm Frink, is designing monsters on his home computer when Kilokahn, an escaped military artificial-intelligence program that was presumed destroyed in the power surge, visits Malcolm via his computer screen. Kilokahn strikes a Faustian deal with Malcolm and turns his digital monster into a Mega-Virus monster. These Mega-Viruses are capable of attacking any device on the electrical grid (including the grid itself), Internet or telephone network, usually having real-life consequences far beyond what any standard computer virus would be capable of achieving. Sam, now as Servo, must enter the digital world and stop Malcolm's and Kilokahn's Mega-Viruses. Sometimes, when Servo was unable to handle a virus by himself, he would call on the help of his friends using his Arsenal Programs. The Arsenal Programs could fight the viruses solo, transform, with the help of other Programs, and attach to Servo as armor. Since Team Samurai consisted of only 3 people at any one time, excluding Sam, only 3 vehicles were available at any one time. When Servo linked up with these Programs as armor, he changed his name to either Phormo when combined with Drago or Synchro when combined with Zenon, respectively). The show focused on three teenagers in their late teens, Ryan Steele, Kaitlin Star, and J.B. Reese, living in the fictional West Coast town of Cross World City, California. They regularly attended and were teachers at "Tao's Dojo," a karate studio. Ryan was the most focused martial artist; J.B. was the computer wizard; while Kaitlin was a photographer & budding reporter for the local newspaper, the Underground Voice Daily. One day, Ryan's search for his long-missing father led him and his two friends to a strange laboratory. Inside, a digitized head of Professor Horatio Hart (who is a friend of Ryan's father Tyler) explained the truth about his life's work of having developed extremely advanced virtual reality technology in secret. "VR" is a dimension existing alongside our own; within it lie mutants bent on conquering both worlds. The main ruler of these is a creature known as Grimlord, who, unbeknownst to anyone on Earth, has a human identity as billionaire industrialist Karl Ziktor. As Karl Ziktor tries to overcome the barriers of the true reality to allow his armies easy passage from virtual world, the responsibility falls to Ryan, Kaitlin, and J.B. of defending the planet on both sides of the dimensional barrier. They have assistance in the form of armored bodies having incredible firepower. This included eventual additions to their arsenal, such as a Turbo Cycle, Techno Bazooka, VR Troopertron, VR Shoulder Cannon, VR Battlecruiser/Interceptop and a flying, laser-blasting Skybase. Other regular characters on the show included Zeb as Jeb, Ryan's hound dog who after an accident in Professor Hart's lab, was now capable of human speech; Woody Stocker, Kaitlin's wacky hat-loving boss at the Underground Voice Daily; Percy Rooney, the local mayor's nephew and Kaitlin's bumbling rival reporter; and Tao, the wise martial arts sensei who owns the dojo and a family friend of the Steele Family. Recurring villains include General Ivar, Colonel Icebot, Decimator, the Skugs, and more throughout. During the second season, the show changed format very slightly. Ryan's father Tyler was finally found and restored to normal. Then, he quickly left to help the government research further Virtual Reality based technology. With him came Ryan's new V.R. armor and an upgrade to his powers. Grimlord's base of operations switched from the virtual dungeon to a massive spacecraft, and added new Generals such as Oraclon, Despera, Doom Master and his Vixens. The Skugs now had the ability to become more powerful in the form of Ultra Skugs. You must have seen the Powerpuff Girls original cartoon series season 1 episode “Bubblevicious” from 1999. The group of fighters are the three titular Powerpuff Girls, three girls born with “ultra-superpowers”. They keep the city of Townsville safe from the giant monsters attacking almost every day. They often fight some more varied and sometimes more intelligent villains too. They're not teenagers yet, but being superhuman, their behavior fits no single age, and varies between kindergarten children to young adults. The Powerpuff Girls are guided by their father, the Professor, who always wears a white lab coat. He doesn't seem similar to a priest or monk, and is generally not virtual. 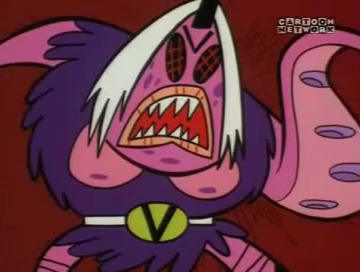 The Powerpuff Girls normally fight in a real city, but the specific episode Bubbleviscious is about the girls training in a virtual world against simulated monsters. This simulation was not created by an antagonist, but by the Professor for the purpose of training in a safer environment than the real world, although it's still not entirely safe. Real world monsters and villains do appear later in the episode. Bubbles fights misshapen monsters in the simulation, which generally have parts that look like they were assembled from different animals, and are usually large and bipedal. Some of these monsters you could describe as a humanoid bug: the monster shown below has composite eyes like a bug, another monster has pincers like that of a crab, and a third monster resembles a bat but does look sort of like a bug in some shots.